Our Free Check Engine Light Code Retrieval Service provides you with quick and accurate answers from a professional technician. Wireless Internet available in our waiting area. 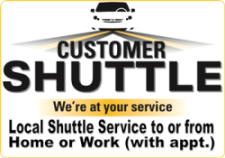 When you schedule your auto repair or service appointment with us, just let us know you will need our Courtesy Shuttle Service. We can drop you off or pick you up.